Join us for a 3-part mini-retreat series during Lent. 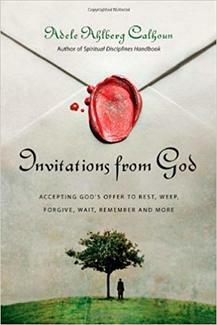 Using Adele Ahlberg Calhoun’s book, Invitations from God, we will focus each session on one particular invitation from the book that God always holds out to us. These will be the "Invitation to Practice the Presence of People," the "Invitation to Forgive," and the "Invitation to Remember." Each session will include a brief presentation on the invitation, a reflection on a relevant scripture passage, discussion of roadblocks and awarenesses that arise around the invitation, and practices to put the invitation in place. We will invite participants to receive and respond to these invitations, and to share as desired with others in the retreat.